Ray Pedden of the Center for Care Innovations in Oakland leads the team that developed the Raven sandbox. Photo: Avram Goldstein. The San Francisco Community Clinic Consortium (SFCCC), an association of community health centers, had long been vexed by the challenge of getting newly enrolled patients to schedule their initial primary care visit. The first visit is not only critical to establishing trust and communication between patient and provider — it is also a significant quality measure. Providers who perform well on it can receive bonus payments, while those who fall short can be penalized. SFCCC wondered if reaching out to these new patients via text message, as opposed to solely by mail and phone, might result in faster, more successful scheduling of the initial visit. They had heard many patients say they wished they could communicate with the office by text. Texting appealed to the member health centers too. After all, it allows for real-time, two-way interactions and easy customization. It can also be an effective alternative method to reach patients who might screen phone calls, or move frequently and miss mail delivery. Yet SFCCC had no idea where to search for a texting solution. Administrators knew from experience that browsing the web and visiting vendor exhibits at conferences was not always productive. So many questions remained unanswered: Which platform could meet the language needs of SFCCC’s particular patient mix? Could anything integrate seamlessly with the electronic health record (EHR) platform and other legacy systems? Would staff members need special training? How would texting fit into the existing workflow? Across California, untold numbers of provider organizations like SFCCC have identified pain points that could be eased with technology. They are eager to find solutions, but many are overwhelmed by what is available. 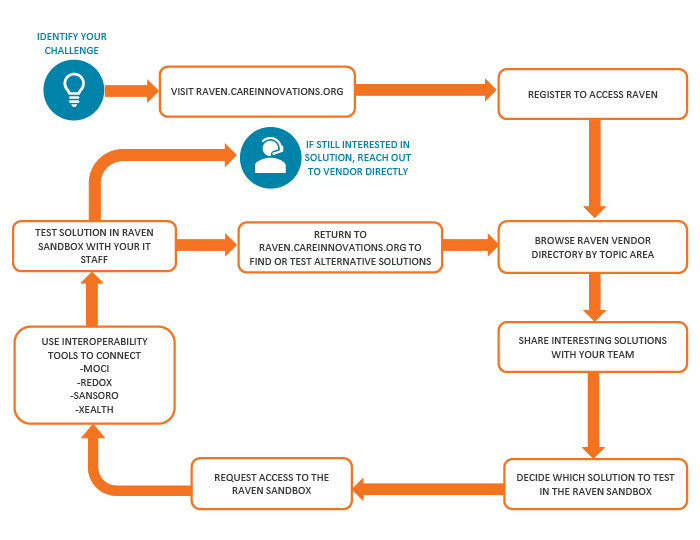 That’s why the Center for Care Innovations (CCI) recently launched Raven, a learning laboratory to help safety-net organizations discover and test available solutions and share user experiences. The California Health Care Foundation supported CCI’s efforts to develop Raven. We know it’s extremely important for safety-net organizations to make the right choices despite limited capacity to vet and implement new technologies. Even when a vendor offers a free or low-cost chance to pilot a technology, that opportunity can carry steep internal costs. The organization’s information technology team must spend precious time integrating the new platform with existing systems. That team must train and support clinical and other staff members, who must take time out of their busy schedules to learn, test, and evaluate a new tool. Patients also can bear some cost if services are delayed or disrupted by hiccups in rolling out the new technology. Discover. A solutions directory gives safety-net organizations a place to start searching for new technologies that meet their needs. Users can filter queries based on their area of need and their particular EHR to ensure that they are looking at a product capable of integrating with existing systems. Test. A testing environment, also known as a sandbox, allows decisionmakers from safety-net organizations to try new software and services within their actual EHR environment. They can work with sample de-identified patient datasets and get an unvarnished look at how a given solution would affect existing workflows and systems. The sandbox currently offers testing with the following EHR platforms: Cerner, EPIC, eClinicalWorks, NextGen, and GE Centricity. More may be added in the future. Connect. For any given solution, users can see if CCI has prepared a written case study on it and if safety-net peers have adopted it. The site makes it easy for providers to connect with fellow safety-net users as well as vendors. For SFCCC, these features helped narrow the search for a texting platform to three vendors, whose pros and cons SFCCC continues to explore using Raven. While these features are free for SFCCC and other safety-net users, commercial users and vendors pay subscription fees to become Raven members. The aim is for Raven to create a kind of learning community where safety-net users can share their IT implementation experiences with one another, browse resources and solutions, and ultimately shorten a long and costly search process for both parties. As with any community, Raven’s value is only as good as the quality of its members. CCI will add dozens more vendors to the Raven database in the coming months, and it invites more to apply. CCI will also host a series of webinars to show safety-net organizations how to get the most out of Raven’s tools. If you have feedback on Raven, I encourage you to share it directly with Ray Pedden of CCI, who worked long and hard to help Raven take flight. He and all of us at the foundation and CCI want to help safety-net organizations deploy technologies that enable them to serve their communities with the right care at the right time. Carl Bouthillette is a former senior program investment officer for the CHCF Health Innovation Fund, which invests in technology and service companies with the potential to significantly lower the cost of care or improve access to care for low-income Californians. Prior to joining CHCF, Carl led the screening and evaluation process for HealthTech Capital, a network of angel investors focused on health care IT companies. He is the founder of Metis Lighthouse, a consulting firm providing strategic and commercial guidance to medical device and mobile health start-ups. Carl also volunteers as an advisor at StartX, an educational nonprofit accelerator. Carl also served as director of Coronary Marketing at Abbott Vascular and ran the company’s operations in Southeast Asia and Canada as general manager. At the start of his career, Carl was an early employee at a start-up company manufacturing custom DNA, genes, and peptides. Carl received a bachelor’s degree in biomedical sciences from Texas A&M University and a master’s degree in business administration from INSEAD in France.